Cambridge’s Saffron Brasserie cooked up a storm for the judges of a national competition and put the city on the map as home of one of the country’s best South Asian restaurants. 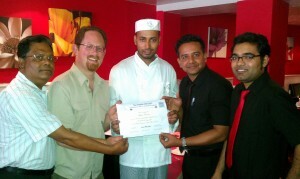 The Hills Road restaurant, which serves Indian and Bangladeshi cuisine, was nominated for the Tiffin Cup by Cambridge MP Julian Huppert and took the prize for runner up in the Regional Finals. Julian presented the restaurant team with a chef’s jacket and hat, embroidered with the Tiffin Cup logo, and certificate after their success in the competition organised by a cross-party group of Members of Parliament known as the Tiffin Club. The Tiffin Cup raises money for charity and this year it is supporting World Vision which aims to combat poverty and its causes, especially as they affect children across the world. Saffron Brasserie director, Hannah Begum said: “This is a great achievement and we would like to take this opportunity once again to thank Julian for nominating Saffron Brasserie, which in itself is a great accolade. Julian is pictured with (from left) restaurant founder, Abdul Matin, chef, Kamal Uddin, Habib Miah and Mahmud Alam.